This is unfortunately not true as a shock absorber (or damper as it should be called) keeps the tyre in contact with the road by “damping” out excessive spring movements and bounce. As we all know tyres need to keep in contact with the road surface in order for the driver to retain control of the vehicle – so without a fully functional shock to keep the tyre in contact with the road surface, no driver would be able to maintain control of a vehicle. 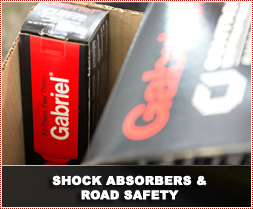 As an added bonus a good shock gives drivers a more comfortable ride and reduces wear on tyres and other suspension components. Essentially a shock absorber is a metal cylinder filled with a special hydraulic fluid, with a top and bottom mounting (to be attached to a vehicle and wheel), which has a piston rod and piston that runs inside a cylinder. The piston has special multi-stage valving built into it, that allows the fluid to move through at a predetermined rate, which in turn restricts excessive suspension and wheel movement. Most shock absorbers today have nitrogen gas injected into the cylinder to improve their reaction time and help to reduce heat build up and noise. Heat is a shock’s worst enemy. Due to the fact that a shock is a mechanical part that changes movement into heat, this heat builds up quickly especially on poor road surfaces. With the heat build up and although the oil is specially formulated to withstand this heat, the oil can become less viscous, allowing it to travel through the valves easier and therefore cause the shock to lose its damping efficiency. This is referred to as fade. Over time and because of the continuous movement of components, this causes a shock to wear out and in some cases for oil seals to leak. As this process of decline is very slow, most drivers will not notice and will adapt their driving to compensate. Which is why it is essential to have your vehicles shocks checked every 20 000km, particularly once a vehicle has reached a mileage of over 70 000km. Do not assume shocks are checked when your car is taken in for a service as this seldom happens. Specify that they must be checked, or take your car into a specialist fast fitment centre and they will check them for you and in most cases, at no charge.